Above, a CCC worker in the 1930s. 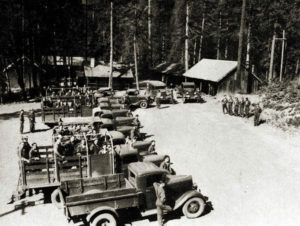 Out of the economic chaos of the Great Depression emerged the Civilian Conservation Corps (CCC). Its purpose was two-fold: conservation of our natural resources and the salvage of our young men. 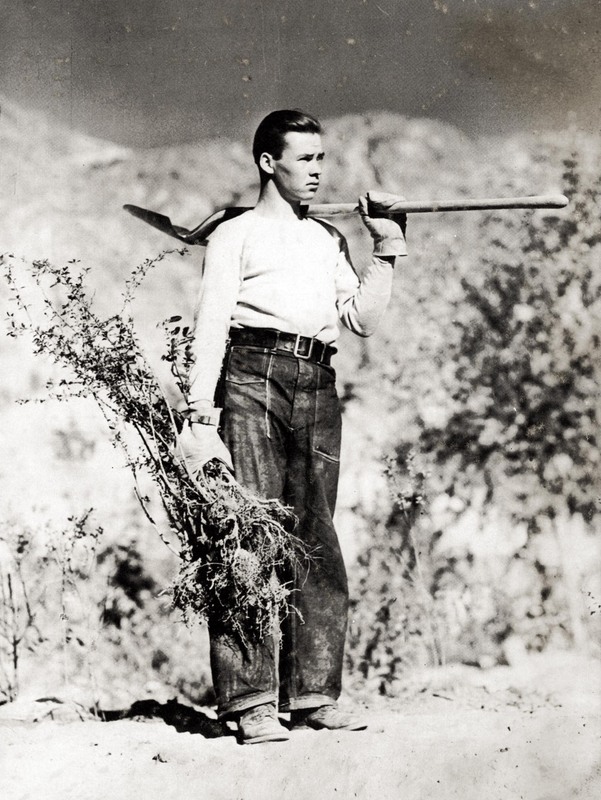 The CCC is recognized as the single greatest conservation program in America and it served as a catalyst to develop the tenets of modern conservation. Growing up in South Dakota during the Dust Bowl was tough. I lived on a cattle ranch and it was hard to keep the cattle alive when the weather was so dry. The economy was also down, making it difficult for us to even feed our cattle. As a kid, I did whatever I could to help my family out, including trapping skunks to sell their coats. In 1938, my dad traded a herd of horses for a 1931 Buick, made a trailer, and moved our family to Hayden, Idaho. Times were pretty tough in Idaho, as well, and jobs weren’t easy to come by. There were no handouts from the government in those days. However, thankfully President Roosevelt threw me a line when I was seventeen years old. I got the lead on the Civilian Conservation Corps (CCC) from a friend and decided to join up. I was in the CCC from 1938 to 1940 and it was probably the best decision I ever made. 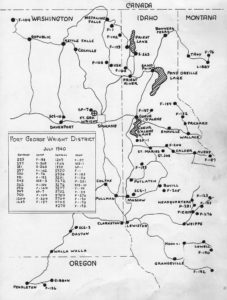 A map of the Fort George Wright District of Civilian Conservation Corps Camps. Kenneth Hart’s Company 1995 camp SP-1 was located at the south end of Lake Coeur D’Alene, in Heyburn State Park. I was one of about 180 men stationed at Heyburn State Park. The work was tough, but it was sure better than milking cows and pitching hay in South Dakota. They kept us busy building signs, campsites, power lines, and picnic tables. We even constructed the Rocky Point Lodge and kitchen, which still stands today. Good work was tough to find in those days, but at the camp I made $30 a week. We were required to send $25 of that home. Eventually I got a raise to $36 and boy was my head big! During the summer months, it was our job to fight fires all around the park in addition to our regular duties. It was dangerous work and we didn’t have any special suits or gear, just the denim work clothes we were given. We were young and energetic and did just fine with what we had. Corps members ready themselves for a new day of adventure and hard work. Photo courtesy of Kenneth Hart. I was on the number one fire crew one summer; we never knew what time of day we would be called out. Once, we were called to a fire in Twin Lakes, Idaho at two in the morning. It was stormy that day and as we hiked up a canyon to reach the blaze, lightening struck a tree about 300 feet away from us, causing it to completely explode. Thankfully no one was hurt, but we were showered with rocks and dirt. I’ve always thought of that as the day I could have died. I made it, and we finished that fire at about 8 o’clock in the morning. Nostalgia Magazine is first and foremost a print publication, delivered by a living, breathing letter carrier every two months. Don’t you prefer to read on printed paper, just like the good ol’ days? Well, you still can. Please support the mission of Nostalgia Magazine by subscribing today. Subscribe online here, or call us directly to order at (509) 443-3678. You’ll be treated to wonderful stories on local history and heritage, and more. Subscribe today! Another time, a crew of us left the camp to build a dike in St. Maries. The guy operating the bulldozer didn’t see where I was and accidentally pushed a huge pile of dirt over me, covering me over my head. For a second I panicked and thought I was a dead man. Thankfully, someone dug me out. When we weren’t working we spent a lot of our free time in the recreation hall at the camp. We could hang out, buy ice cream, play the piano, shoot pool, and even watch movies. All of the men at the camp grew to be pretty close and enjoyed being together. If there was ever a disagreement, the sergeant would bring out boxing gloves and it was settled right there in a ring we had built. We didn’t have to resort to that very often. 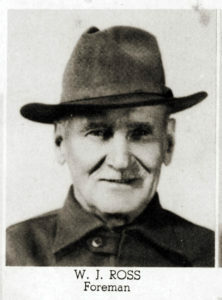 William Ross, known as “Pappy Ross” to his young charges, was foreman of the CCC Camp where Kenneth Hart worked. My boss was named William Ross. We called him “Pappy” Ross and he was a stern old guy. I’ll tell you, when we were around him, we’d think twice about the things we would say and do. Most of the leaders at the camp were ex-military men and they ran a tight ship. Our barracks were inspected every morning, and every evening after work we had to change into our dress uniforms for dinner. We stood at attention when the flag went up and when it came down. Then we didn’t run up to the mess hall like a bunch of cattle. We marched up and broke off in lines into the mess hall, where we each took our place at the table. I couldn’t believe how well they fed us, it was the best food I had for a long time. I came into camp weighing 117 pounds and after eating there for about six months I was up to 140 pounds! On the weekends, when we were lucky, we were able to take a truck to St. Marie’s, the nearest town. There we could see a show for 10¢ and get a hamburger 10¢, as well. Sometimes they even had dances we could go to. I will never forget my time with the CCC. It was two of the best years of my life and I understand why some men cried when their time there was up. One of the greatest things I took away from the camp was an education. At night we could take classes. It was there that I finished my high school education. I also took classes in mechanics, which prepared me to go on to mechanic school. I worked as a mechanic for Utter Cadillac in Spokane for twenty-nine years. I still think joining the CCC was the best decision I ever made. To the best research to my knowledge, the “Boys” made $30 per MONTH not per week, of which sent $25 home.